You may be interested to know that the Freshwater Habitats Trust is having it’s first-ever photo competition: Celebrating freshwater habitats through the seasons. “Successful entrants will have their photo showcased in our 2015 calendar. The competition is open to anyone over 18 years – amateur or professional. You can even submit existing photos you’ve taken. We are looking for images that capture the beauty and diversity of our freshwaters and the wildlife which inhabit them, throughout the calendar year. The closing date for the competition is 30 Nov 2014. 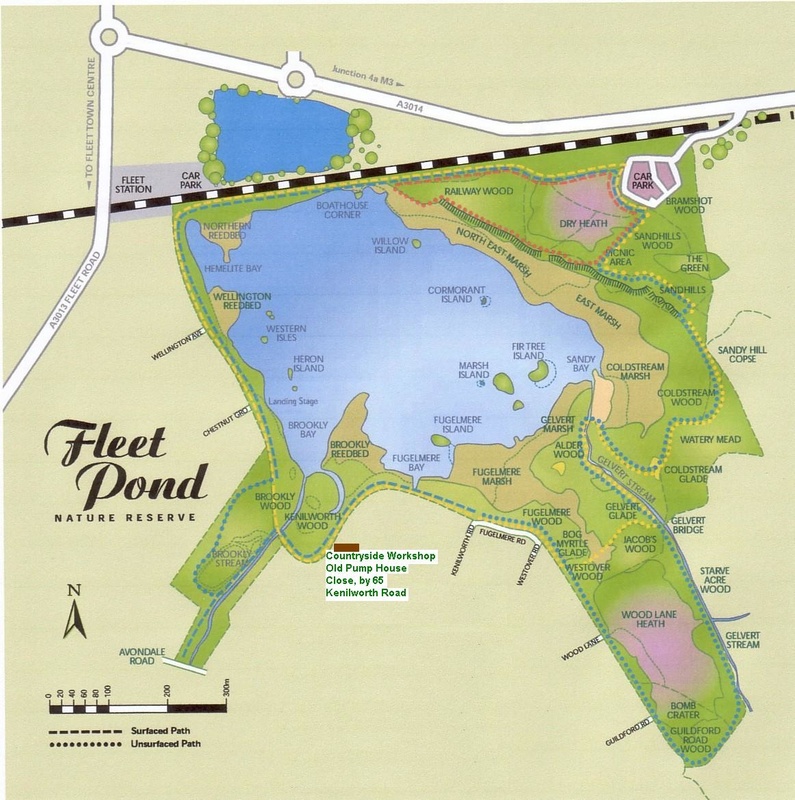 Maybe Fleet Pond would be a good location for entries? 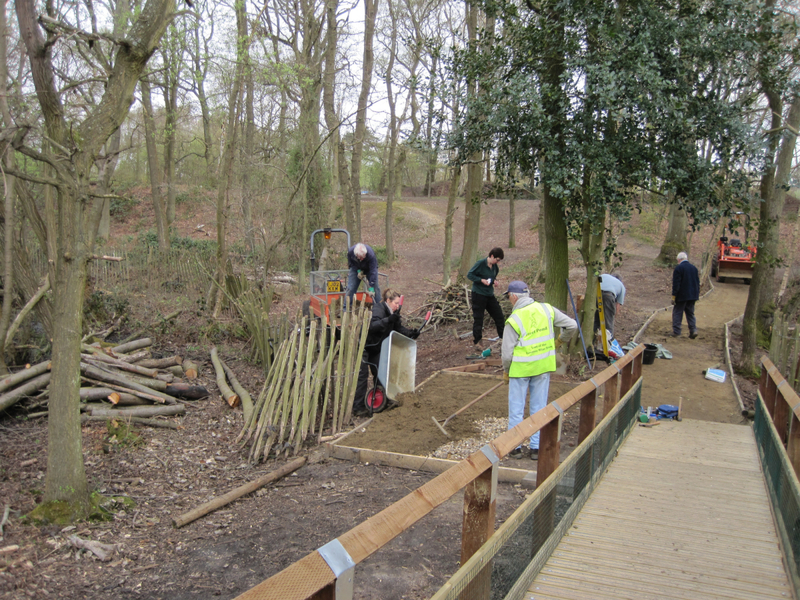 “A fun day was had by all on Sunday with so many hard working volunteers. We had a nice mix of jobs to do so we split up into teams. 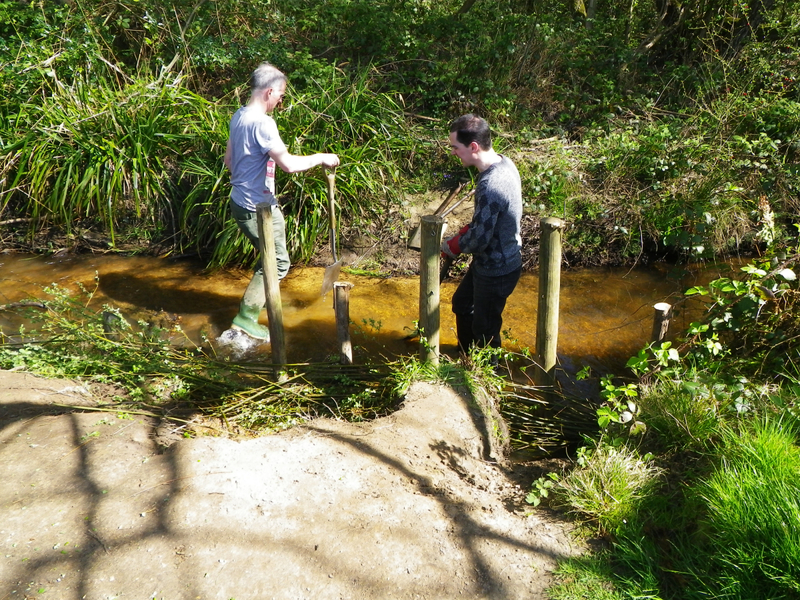 We collected brash along the foot paths, patched up fences, repaired eroding banks and painted part of the new view point. 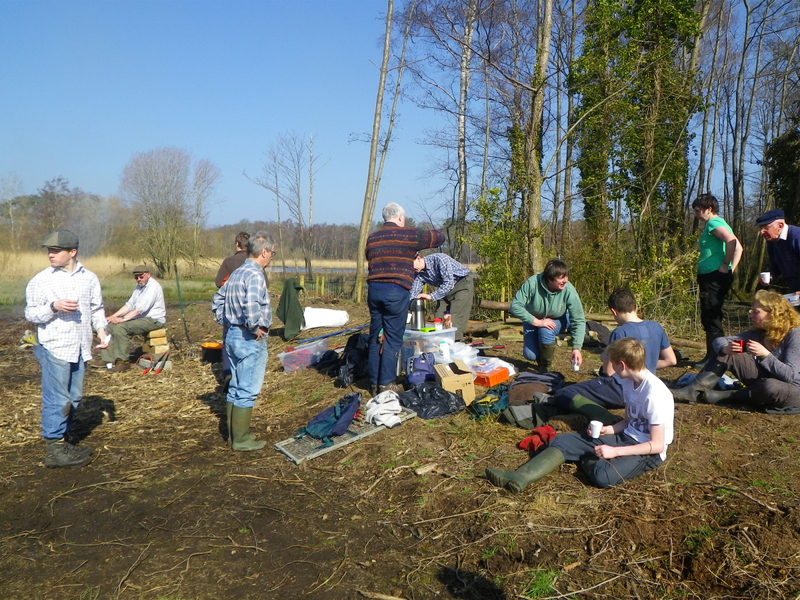 On our Sunday volunteer days, a lot of walkers and visitors to the Pond ask about what we’re doing and who we, Fleet Pond Society (FPS), are. As each monthly activity is different, we’ve decided to use a whiteboard to give some information on the job in hand. 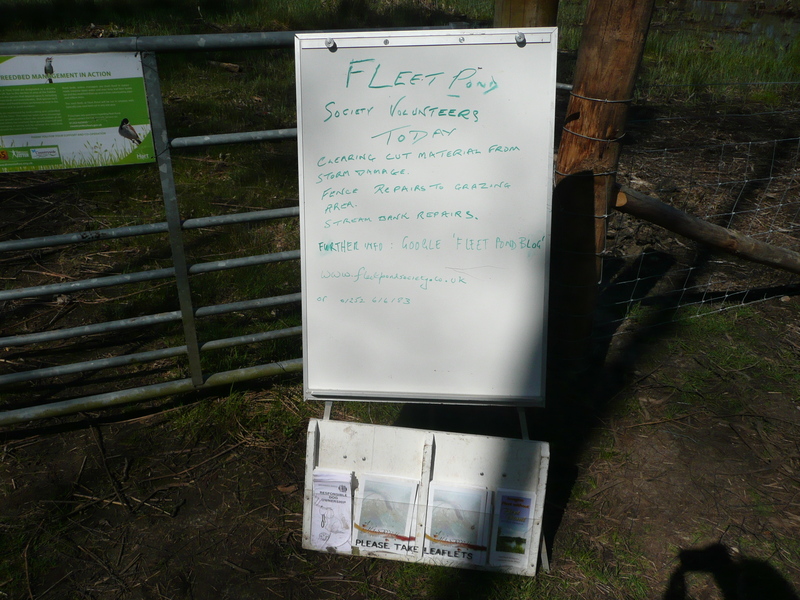 There are also leaflets on Fleet Pond and FPS to take away. Of course, new members are always very welcome! Please see here for how to join FPS (it’s just £10 a year, plus £5 extra for postage if you prefer hardcopy of the newsletters). 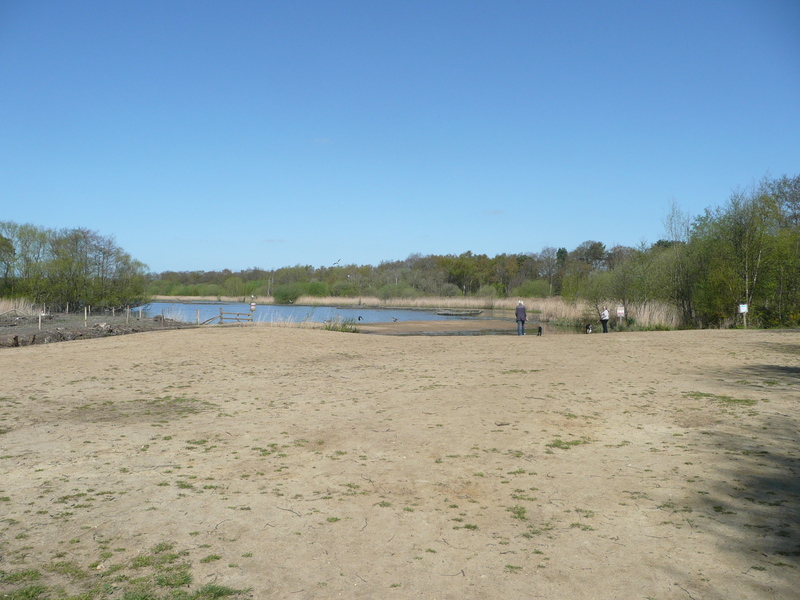 Easter Walk at Fleet Pond on both Friday 18th and Saturday 19th April, 10am – 2pm. 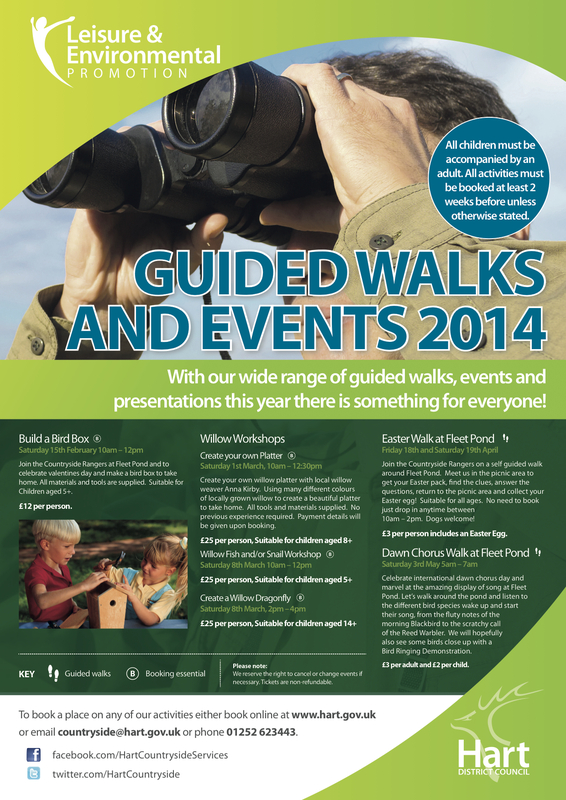 Why not join the Countryside Rangers on a self guided walk around Fleet Pond? Please meet the Rangers in the picnic area (near the car park) to get your Easter pack, find the clues, answer the questions, return to the picnic area and collect your Easter Egg! It’s suitable for all ages and there’s no need to book, just drop in anytime between 10am – 2pm. £3 per person and that includes an Easter Egg! See also the poster below. 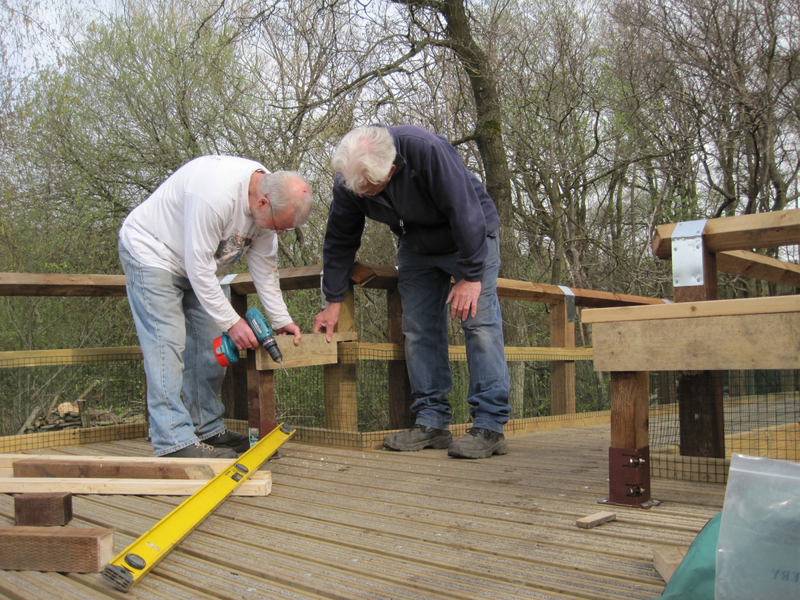 On Friday 4 April, the Last of the Summer Wine Team, under the leadership of Terry Austin, got together (plus Hart Rangers) to put the finishing touches to the spectacular new viewpoint on the eastern side of Fleet Pond, to be called the Lions’ View. 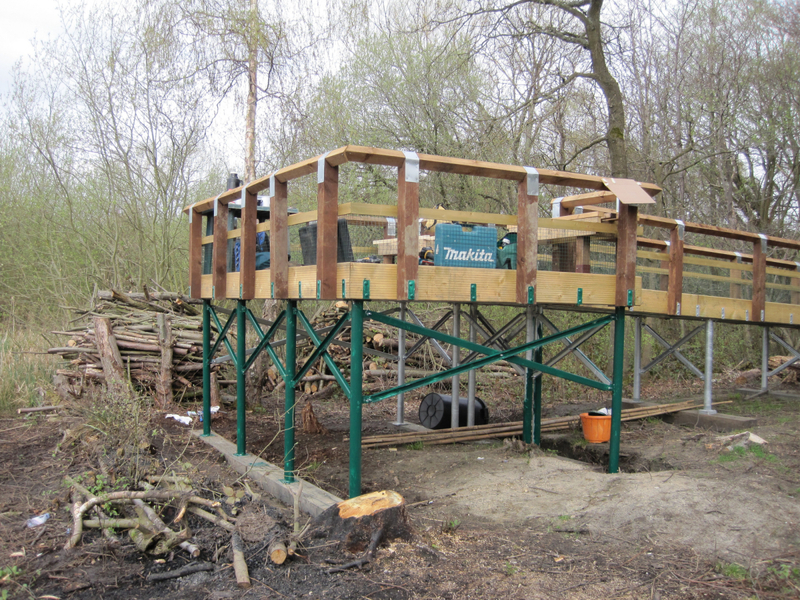 This impressive project has been initiated and lead by Fleet Pond Society and has been very generously funded by a grant from Fleet Lions (hence the name). The official opening ceremony for the Lions’ View will be on Good Friday, 18 April at 11 am. 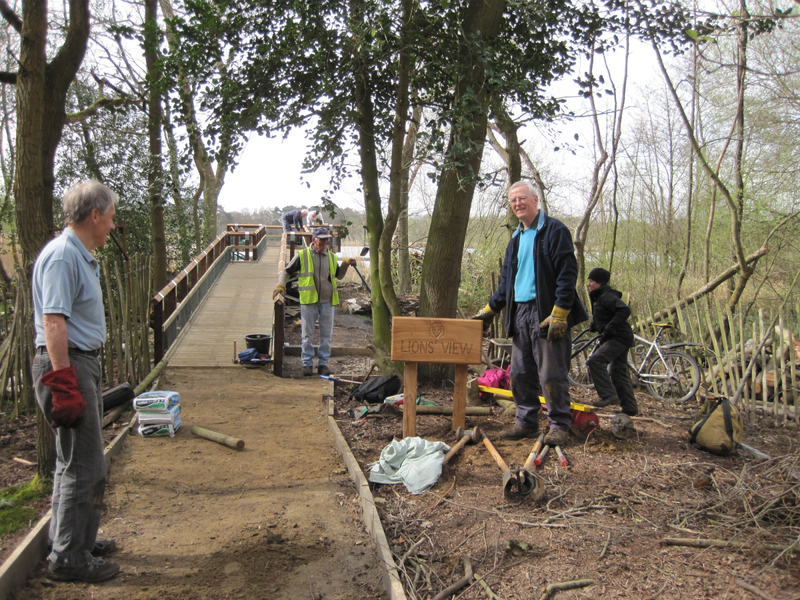 Following on from the very popular Sunday volunteer event in March, the next one is this coming Sunday, 13 April. 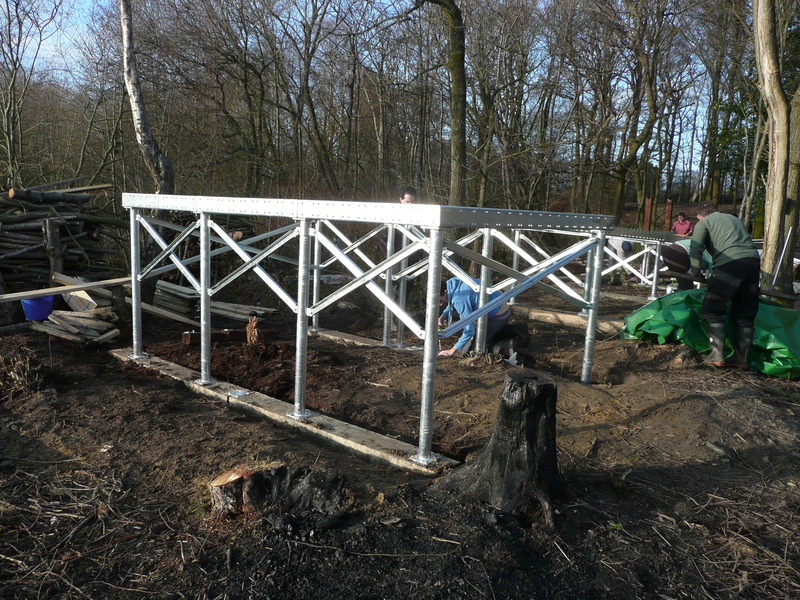 For further information and booking (which is essential as the tools and resources needed have to be planned beforehand), please contact Hart Countryside Services – details here. A picture from the last event (see Fifteen Herons Flying for more details). During the autumn of 2013, the biggest surprise was the number of Small Tortoiseshell butterflies that I recorded in this part of North-east Hampshire. Please see pictures above and below. 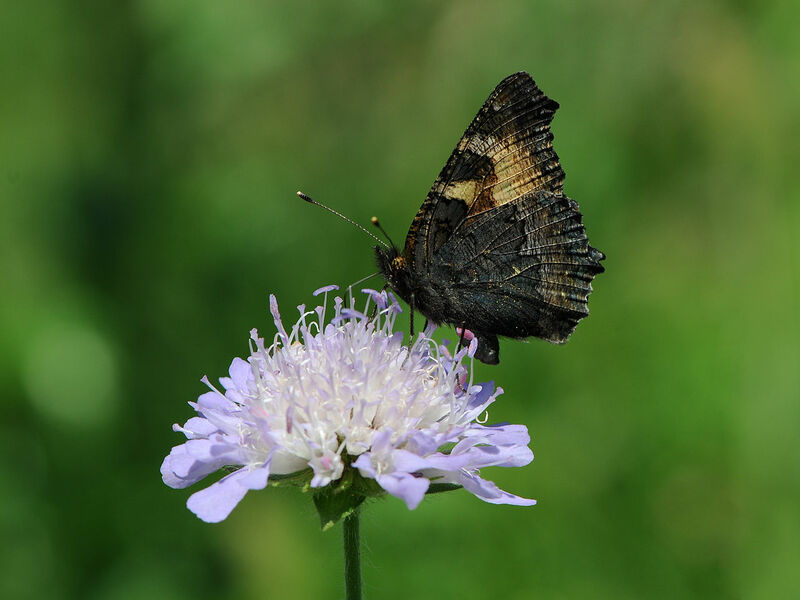 This butterfly, which used to be seen in fairly large numbers, had been badly affected in recent years by a parasitic fly, Sturmia bella, which arrived here from the Continent due to global warming. The fly lays its tiny eggs on the leaves of the food-plant which are then consumed by the Small Tortoiseshell caterpillars when munching the stinging nettle leaves. Grubs emerge from the eggs inside the caterpillars and start to eat them, leaving the vital organs ‘til last. 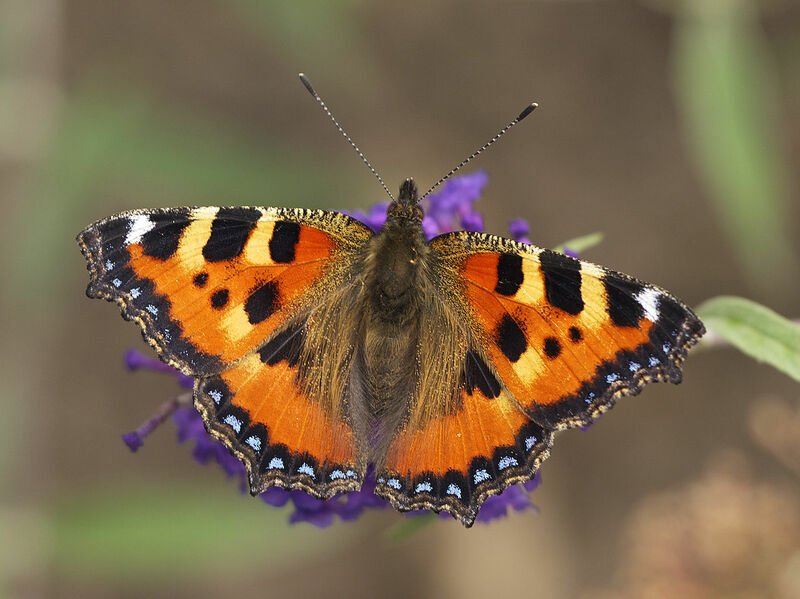 Due to attacks by this parasite, I only saw 8 Small Tortoiseshells in 2008, 11 in 2010, 8 in 2011 and 5 in 2012. In 2013, however, I recorded 88. A National Garden Survey for the whole of the UK showed an increase in numbers compared with 2012 of 388%. Locally, we have bettered this with over 1,600% improvement. Was this due to weather or other conditions making 2013 a bad year for the parasite or could there be a long-term benefit? Only time will tell, but it would certainly be nice to see more of these beautiful insects in future years. David Buckler, a Committee Member of Fleet Pond Society, is currently carrying out a survey for the Amphibian and Reptile Group (ARG). 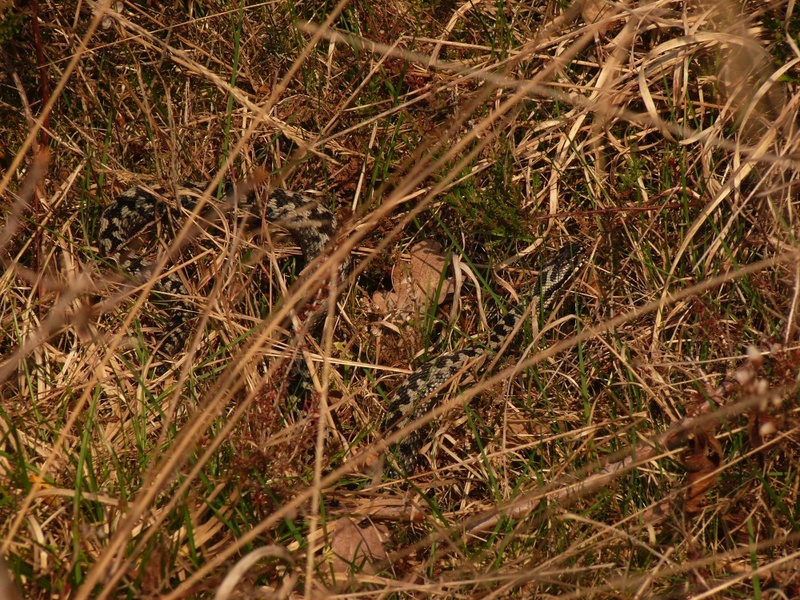 As part of this, David would be interested to hear of any adder sightings at Fleet Pond, especially during March/April. There is a concern that there may be a decline in numbers. You are currently browsing the Fleet Pond Blog blog archives for April, 2014.